Alexander McSween was born in about 1843. He became an attorney and on 23rd August, 1873, he married Susan Hummer. The couple moved to Lincoln County, New Mexico, in 1875 and soon afterwards McSween did legal work for John Chisum. In 1876 John Tunstall arrived in the area. The two men became business partners. By this time James Dolan, Lawrence Murphy and John H. Riley had established the Murphy & Dolan mercantile and banking operation. The company was highly successful and won contracts to supply beef to both the Mescalero Apache Reservation and Fort Stanton. Murphy and his friends were disliked by the small farmers in Lincoln County as they were forced to pay high prices from Murphy & Dolan while at the same time they had to accept low prices for their cattle. In 1876 McSween and John Tunstall set up a rival business. These two men were given the support of John Chisum, the owner of a large ranch and over 100,000 head of cattle. McSween and Tunstall now established J. H. Tunstall & Co, a shop and bank close to the one owned by Dolan, Murphy and Riley. Dolan attempted to goad Tunstall into a gunfight. Tunstall refused to use violence himself but he did recruit Billy the Kid to help him in his business dispute. On 18th February, 1878, Tunstall was killed by William Morton, Jesse Evans and Tom Hill. This incident started the Lincoln County War. Pat Garrett later argued: "The majority of these outrages were not committed by the principals or participants in the war proper, but the unsettled state of the country caused by these disturbances called the lawless element, horse and cattle thieves, footpads, murderers, escaped convicts, and outlaws from all the frontier states and territories; Lincoln and surrounding counties offered a rich and comparatively safe field for their nefarious operations." Billy the Kid joined the Regulators, a group that supported McSween. It was claimed that John Tunstall had been murdered on the orders of Lawrence Murphy and James Dolan. Over the next few months the Regulators killed Sheriff William Brady, George Hindman, William Morton, Buckshot Roberts and others who they claimed they had been involved in the killing of Tunstall. On 19th July, 1878, McSween and his supporters, including Billy the Kid, were besieged by Sheriff George Peppin and a group of his men. McSween's house was set on fire and several people were shot dead as they came out of the house. Ella Davidson was living in the area at the time: "About noon we saw heavy smoke. It was the McSween store that had been set afire by the Murphy men to burn out the McSween men who were surrounded, so they couldn't escape. When the fire was under way Mr. McSween calmly walked to the door as if surrendering and was shot down. Then, two others that followed were riddled with bullets. George Coe, Henry Brown, and Charlie Bowdre were among the crowd that escaped. Billy the Kid was the last one left in the building. During the excitement of the roof crashing in, he rushed out with two pistols blazing. Bob Beckwith, whose shot had killed McSween, was killed by one flying bullet and two others were wounded. The Kid, with bullets whizzing all around him, made his escape." 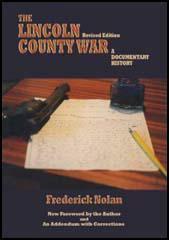 "The Lincoln County War," in which the Kid was now about to take a part, had been brewing since the summer of 1876, and commenced in earnest in the spring of 1877. It continued for nearly two years, and the robberies and murders consequent thereon would fill a volume. The majority of these outrages were not committed by the principals or participants in the war proper, but the unsettled state of the country caused by these disturbances called the lawless element, horse and cattle thieves, footpads, murderers, escaped convicts, and outlaws from all the frontier states and territories; Lincoln and surrounding counties offered a rich and comparatively safe field for their nefarious operations. It is not the intention, here, to discuss the merits of the embroglio - to censure or uphold either one faction or the other, but merely to detail such events of the war as the hero of these adventures took part in. The principals in this difficulty were, on one side, John S. Chisum, called "The Cattle King of New Mexico," with Alex A. McSween and John H. Tunstall as important allies. On the other side were the firm of Murphy & Dolan, merchants at Lincoln, the county seat, and extensive cattle-owners, backed by nearly every small cattle-owner in the Pecos Valley. This latter faction was supported by T. B. Catron, United States attorney for the Territory, a resident and eminent lawyer of Santa Fe, and a considerable cattle-owner in the Valley. John S. Chisum's herds ranged up and down the Rio Pecos, from Fort Sumner way below the line of Texas, a distance of over two hundred miles, and were estimated to number from 40,000 to 80,000 head of full-blood, graded, and Texas cattle. A. A. McSween was a successful lawyer at Lincoln, retained by Chisum, besides having other pecuniary interests with him. John H. Tunstall was an Englishman, who only came to this country in 1876. He had ample means at his command, and formed a co-partnership with McSween at Lincoln, the firm erecting two fine buildings and establishing a mercantile house and the "Lincoln County Bank," there. Tunstall was a liberal, public-spirited citizen, and seemed destined to become a valuable acquisition to the reliable business men of our country. He, also, in partnership with McSween, had invested considerably in cattle. This bloody war originated about as follows: The smaller cattle-owners in Pecos Valley charged Chisum with monopolizing, as a right, all this vast range of grazing country - that his great avalanche of hoofs and horns engulfed and swept away their smaller herds, without hope of recovery or compensation - that the big serpent of this modern Moses, swallowed up the lesser serpents of these magicians. They maintained that at each "round-up" Chisum's vast herd carried with them hundreds of head of cattle belonging to others. On Chisum's part he claimed that these smaller proprietors had combined together to roundup and drive away from the range - selling them at various military posts and elsewhere throughout the country - cattle which were his property and bearing his mark and brand under the system of reprisals. Collisions between the herders in the employ of the opposing factions were of frequent occurence, and, as above stated, in the winter and spring of 1877 the war commenced in earnest. Robbery, murder, and bloody encounters ceased to excite either horror or wonder. (2) Ella Davidson lived in Lincoln, New Mexico, durng the Lincoln County War. She was interviewed about this as part of the WPA Project in 1938. On the Sunday evening before the terrible days that ended the Lincoln County War Mother said: "Ella this is the week that will end all this bloodshed and fighting and, I thank God your father is away and won't be mixed up in the shooting, but I an afraid to stay here with you children unprotected." So that night after supper she took us to stay with the Ellis family, in their house which was built with all the rooms in one long row. About ten o'clock we heard someone with spurs on, come clattering down the whole length of the house. The door where we sat opened and there was Billy the Kid! He was followed by fourteen men who took possession of the house. We went back to our home but Mother was afraid to stay there after she thought our water supply would perhaps be cut off, so we went to Juan Patron's house and about midnight that house was taken over by some of the fighters. We then went to Montonna's store where we went to bed and when we got up the next morning about twenty men had taken possession there, but we stayed there from Sunday evening, until the next Friday morning. Mother got up and after we saw men fired on and one killed, she said, "I am going to take you children out of this danger!" So she took us two miles out of town to where there were some tall poplar trees - they are still there - and about noon we saw heavy smoke. It was the McSween store that had been set afire by the Murphy men to burn out the McSween men who were surrounded, so they couldn't escape. When the fire was under way Mr. McSween calmly walked to the door as if surrendering and was shot down. Then, two others that followed were riddled with bullets. 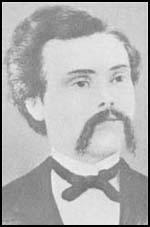 George Coe, Henry Brown, and Charlie Bowdre were among the crowd that escaped. Billy the Kid was the last one left in the building. During the excitement of the roof crashing in, he rushed out with two pistols blazing. Bob Beckwith, whose shot had killed McSween, was killed by one flying bullet and two others were wounded. The Kid, with bullets whizzing all around him, made his escape.